The PBS series on the Roosevelts paid tribute to the importance of having a role model. FDR walked in the footsteps of his fifth cousin Teddy, all the way to the White House. Guy Spier, who runs the Aquamarine Fund, found his role models in Mohnish Pabrai and Warren Buffett. (Spier and Pabrai are probably best known for their $650,100 charity lunch with Buffett.) He has yet to achieve Buffett’s extraordinary success, but he’s a lot closer today than when he started. The Education of a Value Investor: My Transformative Quest for Wealth, Wisdom, and Enlightenment (Palgrave Macmillan, 2014) is not so much about value investing as it is about becoming an investor of value—that is, a person of moral worth and inner strength who happens to earn his living investing on behalf of himself and others. Spier may have gone to Oxford and the Harvard Business School, but he was a naïve soul, easily influenced. He started his career at a sleazy investment bank, D. H. Blair, and admits that it took him “far too long to grasp that this business was set up in such a way that, if [he] wanted to win, [he] would have to lose whatever was left of [his] moral compass.” (p. 18) In the wake of the D. H. Blair fiasco, he discovered the positive power of Tony Robbins’s “brainwashing” and began devouring books by other self-help gurus. And, oh yes, he also started learning about, and becoming fixated with, value investing. He still couldn’t get a job, however. At this point his father came to the rescue and gave him about $1 million to invest for him. Within a year his father invested more, and two of his business associates joined in. The fund’s initial assets amounted to about $15 million. Spier named it the Aquamarine Fund, in homage to his father’s company, Aquamarine Chemicals. Obsessed with improving himself and his business, Spier latched onto a book Charlie Munger mentioned in one of his speeches, Robert Cialdini's Influence: The Psychology of Persuasion. He read and reread this book multiple times and was particularly taken with a story the author told about a car salesman who sold a record 13,001 cars in 15 years, in part because he sent holiday cards to thousands of his former customers with the words “I like you” printed on each card, along with his name. Harry Boxer, a veteran trader and technical analyst, has a subscription website with a live trading room that focuses on trending small- and mid-cap stocks. I don’t know how good it is (on the home page it boasts outsize returns and has the usual rave reviews), but if subscribers make money it’s testament to good old fashioned technical analysis. 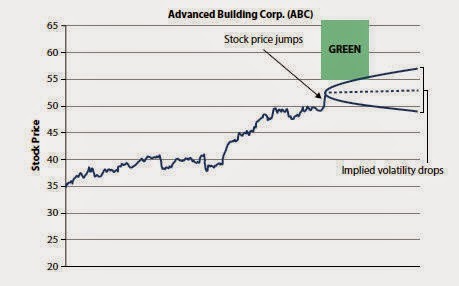 Because in Profitable Day and Swing Trading: Using Price/Volume Surges and Pattern Recognition to Catch Big Moves in the Stock Market (Wiley, 2014) there’s mighty little that’s new. Yes, Boxer does tout the proprietary technical indicator from Worden Brothers, Volume Buzz, that I, who have never used their software, was unfamiliar with. Otherwise, the only things that can’t be found in most other technical analysis books are the ticker symbols—the likes of WUBA, ZHNE, FMI, VISN, MLNX, XPO, ATRM, RGDO, JKS, P, ADEP, ARWR, RMTI, VTR, RNF, DQ, SCTY, GENT, GTN, AFOP, BITA. Boxer includes color charts of these, as well as several other stocks, to illustrate his points. Chapters deal with moving averages, trend lines, targets and stops (including Fibonacci and Elliott Wave analysis), technical divergences, stochastic oscillators, MACD, Bollinger bands, and position sizing and money management. Boxer also offers eleven rules and guidelines to better trading, such as avoid trading during the first 15 minutes of the market open; use limit orders; have a selling plan; keep a journal of all your trades; be willing to lose before you can win; trade strong stocks long in an uptrend, short weak stocks in a downtrend; and wait for the pullback/retest. Purchase of the book includes access to an 80-minute online video seminar. On balance expert systems trump human experts, hence the drive to make trading more systematic and mechanical. The problem is that Building Winning Algorithmic Trading Systems, the title of Kevin J. Davey’s new book (Wiley, 2014), can be tough. Davey recounts his sometimes gut-wrenching journey “from data mining to Monte Carlo simulation to live trading” and provides traders with useful information that will help them avoid his mistakes. The author joins a rather small fraternity of systems developers who have shared their thoughts, for better or worse, with the reading public. I think here—and this list is in no way meant to be exhaustive—of Howard Bandy (Quantitative Trading Systems), Tushar Chande (Beyond Technical Analysis), Urban Jaekle and Emilio Tomasini (Trading Systems), Perry Kaufman (Trading Systems and Methods), Robert Pardo (The Evaluation and Optimization of Trading Strategies), and Thomas Stridsman (Trading Systems That Work). The strength of Davey’s book is that it covers the entire process of designing, developing, testing, trading, and monitoring a system. It also includes Easy Language code for three sample strategies, and on the password-protected companion website (the password is given in the book) there are five helpful spreadsheets. Davey has a spreadsheet to assess the monthly performance of a given system. 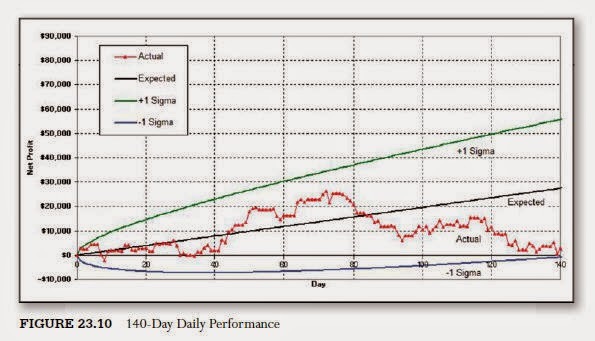 On it he includes, among other things, the expected monthly and annual profit, the maximum expected intraday drawdown, and the efficiency of the real annualized returns vs. the expected returns as well as the drawdown efficiency. That is, if the system projects an annual gain of $12,268 but returns in actuality $8,318 it has a return efficiency of 68%. If the projected worst drawdown is $1,700 and the actual worst monthly drawdown is $1,028, the drawdown efficiency is 40%. Even more discretionary traders can learn from Davey’s book since not only do they presumably trade with a plan of some sort or another, but their performance can and should always be measured. “Gentlemanly capitalism”—what a strange concept to those steeped in twenty-first century business. But it apparently helped the Victorian empire grow. Richard J. Grace looks at two test cases in Opium and Empire: The Lives and Careers of William Jardine and James Matheson (McGill-Queen’s University Press, 2014). The two Scotsmen met in Bombay. Jardine had already had some years of experience as a ship’s surgeon on vessels sailing between England and Canton. Matheson, a dozen years younger than Jardine, had lost his job at his uncle’s agency house in Calcutta but was beginning to discover the dazzling profits that could be earned in opium speculation. The partnership between the two men was still a long way off, but by 1821 “the business courtship had begun.” By the time they became partners in late 1827 Jardine was 44 years old and had lived in China since 1822; Matheson, age 32, had been on the coast since 1820. By 1830 they were the most prominent private English merchants in China. Even during the opium wars between England and China, Matheson continued to ply his trade, though it was considerably dicier and less lucrative. As I read this book I was constantly amazed by the self-justification, in the highest moral terms, of engaging in the opium trade. If this was gentlemanly capitalism, perhaps it’s just as well that it’s a thing of the past. By now you’re probably saturated with all the publicity surrounding Peter Thiel’s book Zero to One (Crown Business, 2014). If you haven’t already read the book or a dozen reviews (or seen Thiel on Squawk Box), you might want to take a look at Shane Parrish’s "Eight Things I Learned from Peter Thiel's Zero to One." Just when I thought there wasn’t room for another book on options for the beginning to intermediate retail trader/investor, along came a text to prove me wrong--Erik Kobayashi-Solomon’s The Intelligent Option Investor: Applying Value Investing to the World of Options (McGraw-Hill, 2015). It’s not just that the author sets out to blend clashing cultures but that he looks at options from a fresh, albeit sometimes controversial perspective. Value investors are known to be patient, to hold onto their positions for long stretches of time as price catches up to value—or so they hope. Options traders, by contrast, always have to keep one eye on the calendar, perhaps even on the clock. Value investors who decide to include options in their portfolios eschew short-dated options; they tend to look a couple of years out. And they embrace directionality—no iron condors for them. As the author contends, “flexibility without directionality is a sucker’s game. … Winning this sort of bet is no better than going to Atlantic City and betting that the marble on the roulette wheel will land on red—completely random and with only about a 50 percent chance of success.” (p. 28) At this point short-term probability traders would most likely throw the book across the room (or stop reading this post). But that would be rash; even they can find useful information in this book. The author’s theoretical probability cones, creatable with a few plug-in numbers on his subscription website, extend indefinitely into the future. The value investor can then overlay his rational valuation range for a particular stock on its Black-Scholes-Merton probability cone and look for discrepancies. Options, of course, provide the investor with leverage, but this leverage is not the same as the leverage you get when you buy a stock on margin. Let’s say you have a $50 stock that you believe is worth $85. Call options at the 65 strike are $1.50. You can either buy the stock on margin or buy options. If you decide to buy options, the $1.50 per contract is essentially an interest payment because it is all time value; it is made up front and is a sunk cost. This “prepaid interest can be offset partially or fully by profit realized on the position, but it can never be recaptured.” (p. 170) On the other hand, “payment on the principal amount of $65 in this case is conditional and completely discretionary.” (p. 168) No matter how the stock performs, you’ll never receive a margin call. By contrast, repayment of a conventional loan from your broker is mandatory, so if the stock drops heavily, you’ll get a margin call from your broker. Although The Intelligent Option Investor is not the first book an aspiring option investor should turn to, it is a worthy complement to some of the classic options texts. As I await the fall offerings from my usual sources, I have wandered off the beaten path—though not this time, I must admit, with especially satisfactory results. I started reading (and, alas, eventually discarded) a couple of books that were longlisted for the Booker Prize, with two more to try out. I’m part way through Opium and Empire, which I may write something about later on or then again may not. And I skimmed two motivational books in search of nuggets to share—looks as if I’ll have to dig deeper since nothing original popped up at first glance. The book begins with letters written by the author in 2010 to an aspiring analyst at the start of his career, inspired by Ian Stewart’s Letters to a Young Mathematician. The second part of the book is devoted to advice from twelve “other voices”—among them, Aswath Damodaran, David Merkel, Jack Rivkin, and Barry Ritholtz—as well as a few people who commented on the original letter series on the author’s website. Part three contains a new letter and part four, a selection of resources. Most of the advice in this book is applicable to anyone starting out in the financial world (or pausing to reflect in the course of his career), not only to analysts. The advice ranges from “read around your subject” to learn VBA (a project that’s been on my to-do list for longer than I would care to admit) to recognize the risks of both insufficient quantitative analysis and over-reliance on quantitative analysis. On balance, pretty sound advice. The author introduces the reader to a wide range of resources—books, periodicals, websites, even Twitter handles. I was familiar with most of these resources but was delighted to find some hitherto unknown gems in the lists. All in all, a pleasant, occasionally uplifting read. For those who already have automated their trading, as well as those who are trying to, here's a word of warning from the airline industry. I've written about this before, but it's worth another look, this time thanks to The New Yorker. Carlisle aligns himself more with Graham than with Buffett, in large part because he believes there is compelling evidence for mean reversion in stocks. His firm, Eyquem Investment Management, examined returns of the top 50% of stocks by market cap in 23 developed-market countries from 1980 to 2013. 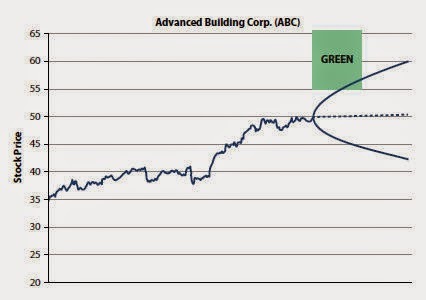 Each stock was sorted according to its ratio of market price-to-book value, cash flow, and earnings. The sorted stocks were then divided into five quintile portfolios, fifteen portfolios in all. No matter which ratio one looks at, the average annualized five-year returns of the value portfolio end up in quintile 5 (c. 13-14%) and those of the glamour stocks in quintile 1 (c. 8-9%). The most sensitive ratio was price-to-cash flow; glamour stocks performed worst and value stocks best when sorted on this metric. Carlisle admits that the value premium also seems to mean revert; recently value has underperformed glamour. The level of underperformance from 2010 to 2013 is perhaps payback for the huge outperformance from 2000 to 2005, and this outperformance may be attributable to the underperformance of value stocks in the late 1990s. 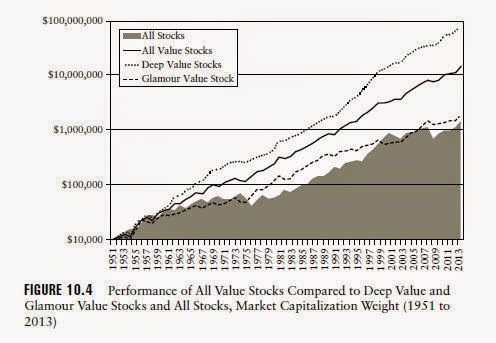 Over the long haul, however, value stocks beat both the market and glamour stocks. The graph below shows the annual returns of the largest 40% of U.S. stocks by market cap from 1951 to 2013. The value portfolio comprised one tenth of the All Stocks universe (c. 114 of 1,140). This portfolio was further subdivided. The cheaper half of the value decile, those with the highest ratio of EBIT to enterprise value, is the Deep Value Stocks portfolio; the more expensive half is the Glamour Value Stocks portfolio. The Deep Value portfolio saw a compound annual growth rate of 15.72%; the Glamour Value portfolio, 8.84%. I don’t want to give the impression that Carlisle’s book is simply a bunch of numbers and charts. Far from it. It recounts famous deals and portrays successful deep value investors, which makes it an enjoyable read. But the most important takeaways—and why the book is worth careful study, not just a quick read—are that “valuation is more important than the trend in earnings” and, counterintuitively, that, “even in the value portfolios, high growth leads to underperformance, and low or no growth leads to outperformance.” (p. 211) In brief, contrarianism pays off.